Lovely and literary, suiting up in these Jane Austen-inspired socks requires little Persuasion. For the lady who takes Pride in being both well-read and well-dressed, meet our new Jane Austen-inspired socks. Adorned with 18th century-style floral patterns and the silhouette of the wordsmith herself, this lavender pair adds the perfect pop of whimsy to any bookworm's wardrobe. Designed in Santa Cruz, California, made in South Korea. Quote- "I declare after all there is no enjoyment like reading!" Cozy, fun socks! My wife loves Jane Austen and thought they were great. I got these socks for my daughter who is a new Jane Austin fan. They are good quality; it looks like she'll be able to wear them for years to come. Beautiful light purple socks that are soft and thick so they should be very durable. These were the perfect addition to a pair of shoes that was also being gifted. 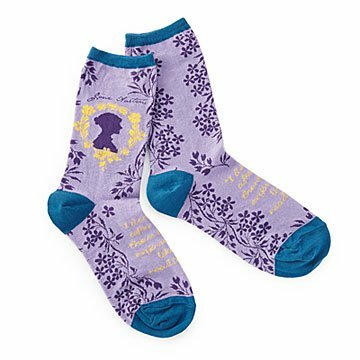 These were a great add-on gift for my Jane Austen loving niece. The recipient loves these socks! I gave it to a friend for her birthday. She loved it. Great gift for anyone who loves Jane Austen! My friend loved them & will get very good use out of them. Nice socks. Nothing fantastic, but hey, they are socks. They keep your feet warm and fairly clean. The wife loved them. Good gift.